Welcome to our second giveaway of the month in honor of our Blog's Grand Opening! 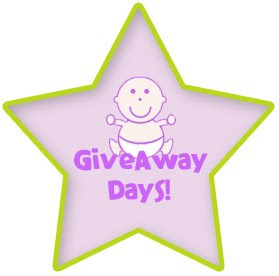 This weeks winner will win a Knickernappies Doorknob Diaper Pail in the COLOR of their choice. First requirement is to tell us what color doorknob pail you'd choose and why you'd love to win this giveaway! Contest is open to participants WORLDWIDE. Contest runs from Monday 12:00am to Friday 9:00pm. Winner is chosen via random.org and winning announcements are posted on Saturdays. Earn (1) extra entry when you place the Knickernappies Blog Button on your blog or site and comment with a link to where you placed it. Earn (3) extra entries when you invite your FaceBook Friends to become a FAN of Knickernappies or Announce the Giveaway. Earn (1) extra entry for each comment you leave to a non giveaway blog post on the Knickernappies Blog. I would love to have the Celery color. I would choose the celery color and I would love to win this giveaway because I have a baby girl due at the beginning of May. I've never CD and am going to with her, so I need all of the accessories/tools that go along with it! Thanks for the chance! I placed the Knickernappies button on my blog. Thanks for the giveaway opportunity! I would love the raspberry color doorknob diaper pail. Love this idea!! I would love to win this give away because I don't yet have a Cloth diaper bag! I would love the Royal Blue color. I would love to win the Royal Blue doorknob diaper pail! I would like to win because my sister is expecting a baby boy and I love the idea of this so much more than the diaper genie!! Check out @knickernappies new giveaway: http://knickernappies.blogspot.com/2010/03/knickernappies-giveaway-days-week-2.html "
I would LOVE to win one in Chocolate! I've been wanting one of these bags for a while!! I would chose the chocolate color. I would love to win this b/c I only have one diaper pail liner and when it's in the wash, I have no place to put my diapers. We have one of these in our bathroom just for the dirty diapers after we've sprayed them. It's so nice not to have to run back to the changing table with the drippy diaper. I've been considering buying one of these. The 5 gallon bucket is getting stinky! I love the royal blue. I'm a fan on Facebook - that's how I found out about the contest. I would choose the Celery color. I would like to win because I am not satisfied with my current doorknob pail. I would like to try a different one. Spring green. I know 3 people that are pregnant, and may use cloth diapers, but aren't sure. If they all bail out, I may keep it myself, but otherwise, I'd probably gift it to one of them! I just bought my second liner...chocolate. I already have the blue one and would love another liner! Like celery need a ganging pail. I would love the Royal Blue bag. I just started cloth diapering and would love to have a second bag for wash days. FB Fan would love a butter yellow bag. I shared on FB, would love a butter yellow bag. I have a rubber duck theme in my house and I don't have anything yet for my unborn. I'd love to start my stash, but I'm waiting to find out what it will be. A butter yellow bag would fit perfectly in my bathroom. I would love to win the chocolate because it would match my new baby girl's room and I need a new one! I would love the Raspberry. I could certainly use something this pretty & practical. I'd like turquoise. I'd like to win because I need another diaper bag so I am not stcuk doing laundry late at night when my son is sleeping. I'd pick the spring green or butter! I would choose royal blue! It would match my decor perfectly! I really need another doorknob pail...I bought a whammies pail liner, and it fell apart in a few months! posted on the hemp 411 thread! I would choose the celery color. These look great! I would choose the chocolate color. I need this because I don't have one. I have just been using a trash can. "Head over to @knickernappies to win a door knocker diaper pail! http://tinyurl.com/ydtngmr"
I like the turquoise. Would look great in our nursery! I would choose the celery color! I'm a new to CDing mom and my little girl just got here this week! (March 4th!) It'd be a great help to have a doorknob pail like this to hang in one of the places in the house that isn't fully 'set up' for changing diapers yet. I managed to get all my basics, but am finding that as I go there are some things I'd still like to get together to make diaper changes easier. It'd be nice to have a small place to put diapers in the front of the house. I'm a fan of Knicernappies on Facebook! I would pick chocolate. I would love to win because I could put one in the laundry room for the diapers that I get back from the sitters each day. I'd choose Chocolate and I'd love to have it to be able to hang on a doorknob in my bathroom or while taking overnight trips! I'd choose chocolate to match our bathroom colors. We're going to be using our diaper sprayer soon and I would love to have a wetbag to keep in the bathroom. I would love one in spring green. I don't currently have a diaper pail... I use a rubbermaid tub in the bathroom. a doornob pail in the kids' room would be handy. I'd like the Spring Green one. It would be great to have one of these handy in the nursery. I would choose raspberry because it would match my DD's decor perfectly! I want to win this because this looks like the perfect wetbag! I'd love to win the Violet Doorknob pail ! Follow Knickernappies on Twitter @momof3dolls. I like the chocolate. I need one for the changing table. That would make changing dipes easier! Your baby wears cloth! Why don't you? How to fight the funk! Knickernappies Giveaway Alerts! Check them out!